Koenig up to 10 points, and the #Badgers use a 5-0 run to pull within 30-25 with 3:49 left. It's actually to UW's credit that they are keeping this close. Michigan is shooting the lights out of the gym and Badgers are only down 5. #Badgers with consecutive stops -- for just the third time this half -- and trail, 30-25, with 3:49 left. A tough bucket inside from Ethan Happ and a 3 from Bronson Koenig help the #Badgers pull back within 5. MICHIGAN leads, 30-25, with 3:49 to play in the first half. @DerrickWalton10 with 12 points already. 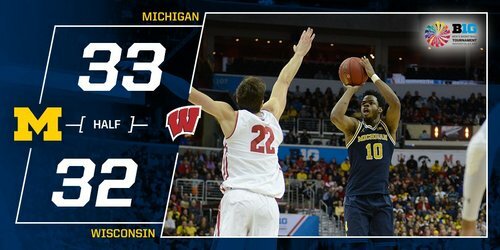 One thought: Michigan at 63.2% shooting but hasn't been able to pull away from #Badgers -- yet. Nice move by Happ for the up-and-under. Badgers down three after a 7-0 run. Not sure who's directing this broadcast for CBS, but assume they are a frustrated former film student. That is two bad late sequences by #Badgers Koenig -- missed runner and a SC violation. 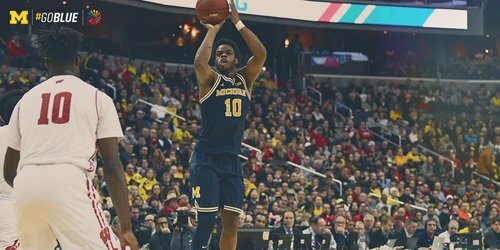 Michigan with four empties in a row since Walton's trifecta of 3-pointers. Wolverines up 30-27 with 1:45 left. Koenig into double digits with 10pts. Hayes has 8 for the #Badgers . 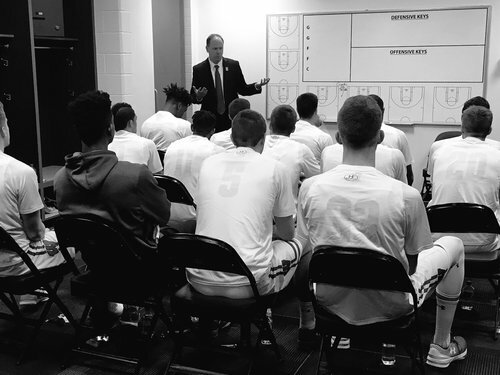 Michigan has seven threes and no FTs. Halftime: Michigan 33, #Badgers 32. Walton with 12 points, Koenig with 13. HALFTIME: No.8 Michigan 33, No.2 Wisconsin 32. 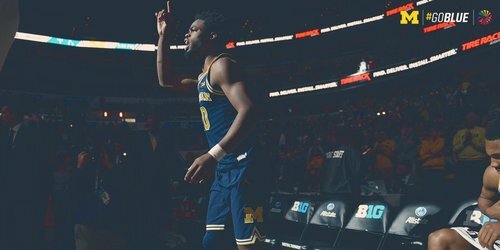 Wolverines 7-for-13 from 3-point range, 6-for-9 from 2. Koenig a 3-pointer at the buzzer. Fun one so far in D.C.
#Badgers Koenig (13 points) closes half with a three and UW, which allowed FIFTY-NINE% shooting, is down 1. FIRST HALF SCORING: Koenig 13, Hayes 8, Happ 8, Showalter 3. UW shot 53.8 percent (14-for-26), 4-for-7 from 3. Koenig with a dagger three from NBA range to close the Wolverine lead to one going into the half. PPP: Michigan 1.22, #Badgers 1.14. 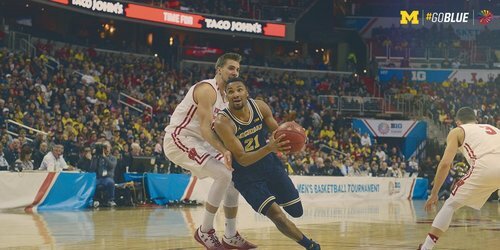 Michigan shot 59.1 percent, UW shot 53.8 percent. 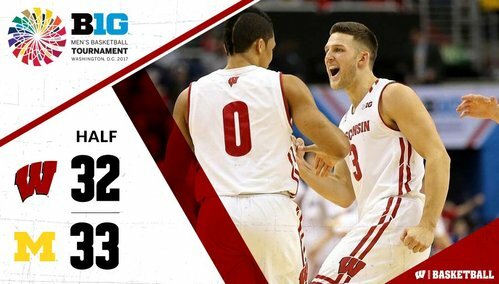 Badgers have to feel good. Matched UM's intensity and shooting. UW FG%: 53.8% from floor, 57.1% from 3. UM: 59.1% and 53.8% from 3. Big half (13 points) for #Badgers G Bronson Koenig. Wolverines shot 59 percent in first half and only lead by one. @DerrickWalton10 with a team-high 12 points so far. Where in the world would you rather be? Perusing some NBA mock drafts and not seeing any w/ Koenig in projected 1st Rd. If so, he'll be a 2nd rounder w/ a 10-year career. #Badgers Happ started out 1-5. He is now 4-8. #Badgers 0-2 shooting and 3 TOs this half. Five empties in a row for the #Badgers to start the second half. Three turnovers in that span. Sloppy play from UW. Over four minutes into 2nd half with no points. The UW bench called that last foul for D.J. Carstensen. Michigan up 39-32 with 14:53 left. Badgers' empty possession count at 6. #Badgers Gard has been all over the refs about pushing/hand-checking. Michigan opens 2nd half on 6-0 run to lead 39-32. 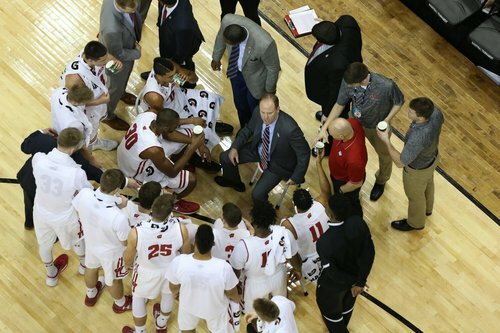 Wisconsin has come up empty on its first six possessions, including three turnovers.